Got around to putting in the Jerusalem artichoke! 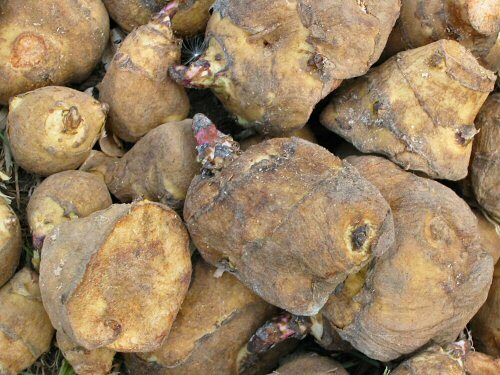 I purchased 45 of these somewhat gnarly-looking tubers, some whole, some cut up, from a small seed house—”chokes” aren’t an everywhere find, although I’m told they actually grew here in the backyard of the farmhouse in decades past. This should be an interesting new crop, a kind of potato substitute with a “nutty taste”. They’re perennial, so they went in a semi-permanent spot in the herb garden, there to multiply! 3. Great post. I was checking continuously this blog and I’m impressed! Extremely useful info specially the last part :) I care for such information a lot. I was looking for this particular information for a very long time. Thank you and good luck. Jersulaem fartichokes. They taste good enough but not so good as to go through all of the farting afterwards. I grew these this year and won’t be growing them again. My wife makes relish out of these and it is really good and the only way I have ever eaten them. …..love your site and am inspired to make my 1.3 acres grow some food.